2). Harry Reid is a despicable thug who should never be allowed near a microphone again. Interesting that the only border wall that this lawless gang is interested in building is to keep American citizens off of "Federal" land. 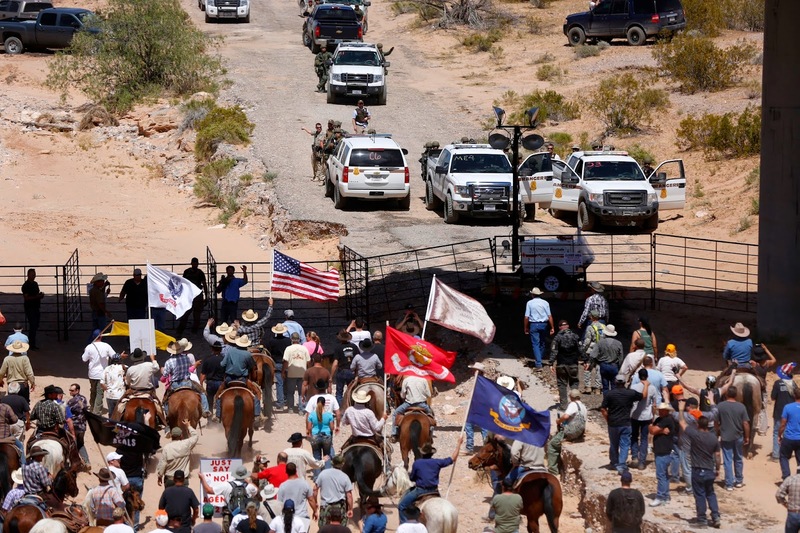 From what I gather, the rancher involved, Cliven Bundy, is probably on the wrong side of the law here, but first, it appears that the law is on the wrong side of freedom and American values, and second, when has the Obama administration ever cared about following the law? I think Cliven Bundy needs an image makeover, a redefinition, so that progressives will be able to join intelligent people in rooting for him. We know that Bundy and his family have grazed their cattle on this land for a long time, though they never really owned it. If we call this his ancestral home and say he has the Right of Return to his land? Presto! Cliven Bundy is now a Palestinian, and if there's one thing progressives love, it's the Palestinians. Even better, this makes the government the State of Israel, and everybody knows that progressives HATE Jews. So now you have a Palestinian bravely standing up against a bunch of hated Jews, which any progressive would be proud to support. And with the Searchlight Strangler calling Bundy's supporters "Domestic Terrorists," this just makes the analogy all the more apt. And what is the deal with all the hatred for domestic terorists? I thought we were supposed to live them, William Ayers, Bernardine Dohrn, and their ilk. You know, the president's pals. We could look at it as him crossing the border onto U.S. territory and trying to make a living there. He's just trying to make a better life for his family. Why, he's practically a DREAMer. And he doesn't have any paperwork to back up his claim to be on that land. He's an Undocumented Immigrant! Let's hear the chant; "People Aren't Illegal! People Aren't Illegal!" And of course, now that we've learned he hold views that are a bit (antiquated?) out of the mainstream on the subject of "People of Color," we have the perfect opportunity to cast him in the perfect role for winning support: a liberal demokkrat. Perhaps he could spend some time as an Exalted Cyclops in his local Klavern. Then he can run for the Senate. After half a century or so, they can eulogize him as The Conscience of the Senate. Hey, it worked for Robert Byrd. On the other hand, all he said was he sees a lot of black people that have no options other than to collect welfare checks and live in subsidized housing. To be a demokkrat, he'd have to change that to "ALL" black people, and ONLY black people, so that he could cry racism everytime a Republican tried to make the slightest change in the program. He's not the perfect guy to be the poster child for a movement, but then, if he were, he'd likely be a blank slate on which anyone could cast their hopes and asprations, to be whatever theywanted him to be. In other words, he'd be an empty promise, sort of like Obama.